By Dan Ambrose: After six years of campaigning in the 154 pound weight class, WBO junior middleweight champion Jamie Munguia (33-0, 26 KOs) may have reached the end of his time in the division following his close 12 round majority decision win over mandatory challenger Dennis Hogan (28-2-1, 7 KOs) last Saturday night in their fight on DAZN at the Arena Monterrey in Monterrey, Nuevo Leon, Mexico. The 22-year-old Munguia looked slow, tired and weaker than previous fights in winning a questionable decision over 34-year-old Irish fighter Hogan. A day after the fight, the boxing public is split in who they felt won or should have won that fight. Many fans felt that the visiting fighter Hogan was robbed by the judges in being given a loss that he didn’t deserve in Mexico. Munguia says he learned about getting frusted, but he must have learned after the fight, not during it. Munguia was still looking frustrated in the final two rounds of the fight in the 11th and 12th rounds with the movement and the accurate punching of Hogan. There wasn’t a moment in the fight where Munguia didn’t look frustrated. He says he learned about frustration, but those are just words. Until Munguia proves that he learned from the fight, you have to take what he says with a grain of salt. Whatever way fans want to look at it, the win wasn’t a conclusive one for the young Golden Boy Promotions star Munguia, and not the type of fight that will be easy for him to walk away from with his head held high. It’s believed that Golden Boy won’t give Hogan a rematch, which is bad for Munguia, because he can’s show the fans that the poor performance was just a fluke thing. The fans are going to see it as a case of Munguia being pampered by the judges in the same way that many fans felt about Saul Canelo in his two fights against Gennady Golovkin, and in his fights with Erislandy Lara and Austin Trout. Munguia won by the scores 115-113, 116-112 and 114-114. Boxing News 24 had Hogan edging it by a 115-113 score. At best, one could call the fight a draw, but definitely not a win for Munguia. He didn’t appear to do enough to deserve the victory. After the fight, Munguia seemed to suggest that the weight was a problem for him, and that’s why he struggled so badly to try and get the victory. Golden Boy and Munguia will sit down and decide whether he should make a couple more defenses of his World Boxing Organization junior middleweight title or move up immediately to the 160 lb weight class. One reason why Munguia should put off moving up to middleweight until 2020 is the fact that he just made a mandatory defense of his WBO 154 lb title. That means Munguia can use his next two fights to make easy voluntary defenses against fringe contenders that pose no threat to beating him. In other words, Munguia can get a couple of easy paydays as the WBO junior middleweight champion before he moves up to middleweight in 2020. Since the judges gave Munguia the victory over Hogan, he doesn’t need to fight him a second time if he doesn’t want to. Of course, it would be in Munguia’s best interest to fight Hogan again to show the boxing public that he can improve from his previous performance against him, but he doesn’t have to. If Golden Boy can set Munguia up with an opponent that draws more interest, more money, and helps improve his popularity, then that would be the way to move up career. It could be that Hogan is a bad style match-up for Munguia, and will always have a bad style for him. “Truthfully, as the round was coming to end, I thought it could be a draw,” said Munguia.“I decided to come out in the last round and give it my all for the victory, but truthfully it was difficult. I wanted to give the victory to my people. He would hit me in the head and then give me a low blow. He would also hold and not let me get in my rhythm. Either way, we must continue with our preparation. If you go by the CompuBox Statistics, Hogan won the fight. He landed with a higher percentage of punches than Munguia, and his shots were the cleaner, more effective blows. Hogan controlled the contest in the second half of the bout. In the 11th, he had Munguia hurt after catching him with a right hand that he wasn’t expected. It didn’t matter that Hogan wasn’t the biggest puncher in the division. 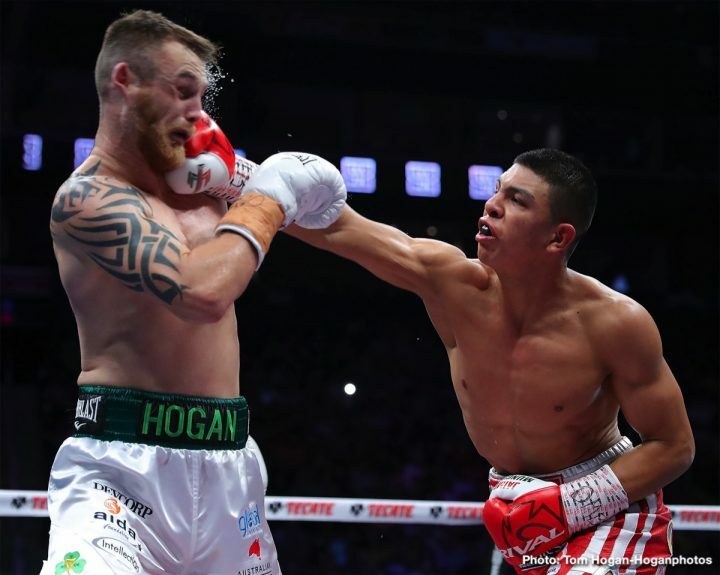 The combination of Munguia being tired, sloppy and desperate in the last four rounds of the fight left him open quite frequently for Hogan’s shots. Munguia would be better off testing out the middleweight division the way that WBO super middleweight champion Gilberto “Zurdo” Ramirez recently tested out the light heavyweight division before he makes a decision to move up in weight or not. Munguia might not be any better at 160 than he is at 154. In that case, Munguia would be better suited to remain at 154 for as long as he can make weight. Munguia has more of an advantage in fighting at junior middleweight than he would if he moved up to middleweight and took on fighters that are the same size as him or bigger. Unless Munguia knows for sure that he’ll be better at middleweight than he is at junior middleweight, he should stay at 154 for as long as he can. Once Munguia moves up to 160, he’ll be just like any other contender in that weight class.